A cast of singers and special guest artists will be performing the film’s acclaimed songs live. Conductor John Mauceri, Founding Director of the Hollywood Bowl Orchestra, will once again be leading the full orchestra and choir performing the film’s classic score and songs live to picture. Last year’s NIGHTMARE AT THE BOWL was named “#1 Concert of 2015” by the Orange County Register beating out such shows as The Foo Fighters, Janet Jackson, Garth Brooks, Shania Twain, Willie Nelson, Neil Young and The Rolling Stones. Not since Elfman’s iconic Oingo Boingo Halloween concerts have his fans been offered such a holiday treat. 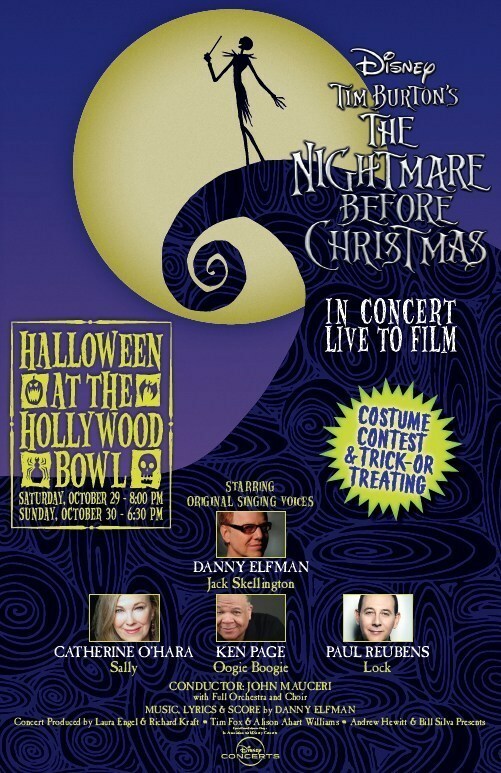 HALLOWEEN AT THE HOLLYWOOD BOWL- TIM BURTON’S THE NIGHTMARE BEFORE CHRISTMAS- IN CONCERT LIVE TO FILM will transform this legendary venue into Halloween Town with special pre-show activities including an audience participation costume contest, unique photo opportunities and trick-or-treating stations. Tim Burton-inspired costumes are encouraged. 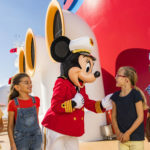 The concert is produced by Laura Engel & Richard Kraft, Tim Fox & Alison Ahart Williams and Andrew Hewitt & Bill Silva Presents, in association with Disney Concerts, the team that recently presented the highly-acclaimed DISNEY’S THE LITTLE MERMAID IN CONCERT AT THE HOLLYWOOD BOWL starring Sara Bareilles and Rebel Wilson. First released in 1993, Tim Burton’s THE NIGHTMARE BEFORE CHRISTMAS was directed by Henry Selick (JAMES AND THE GIANT PEACH), and based on a story and characters by Tim Burton. 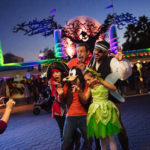 The film follows the earnest-but-misguided adventures of Jack Skellington, Halloween Town’s beloved Pumpkin King, as he attempts to take over the Christmas holiday. Against the advice of Sally, a lonely rag doll who has feelings for him, Jack enlists three mischievous trick-or-treaters – Lock, Shock, and Barrel – to help him kidnap Santa Claus. The film is rated “PG”. DISNEY IN CONCERT TIM BURTON’S THE NIGHTMARE BEFORE CHRISTMAS is produced under license by Disney Concerts, a division of ABC Inc. Disney Concerts currently licenses 14 different concert packages including Fantasia, Pixar In Concert, Alice In Wonderland, Frozen, Ratatouille, The Pirates of the Caribbean series (episodes I-IV), and Silly Symphonies, which last year accounted for approximately 325 performances in some of the world’s top venues, including Lincoln Center, Royal Albert Hall, Sydney Opera House, Tokyo Forum and the Hollywood Bowl. All acts and ticket prices subject to change without notice. Know Before You Go: www.hollywoodbowl.com/lease for parking information.